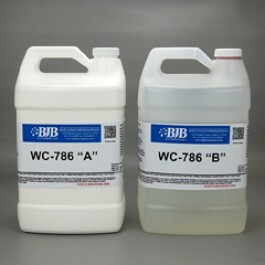 WC-786 A/B produces a high impact, rigid, 80 Shore D material that is commonly used to make clear or tinted castings of all kinds. When used at room temperature castings 1/8" thick or larger can be readily cast. Castings that are less than 1/8" thick generally require pre-warming of materials, molds, and mild post-cure. Easy 1:1 by volume mix ratio for machine casting.